Hi and welcome to Freshly Made Sketches Challenge Day! 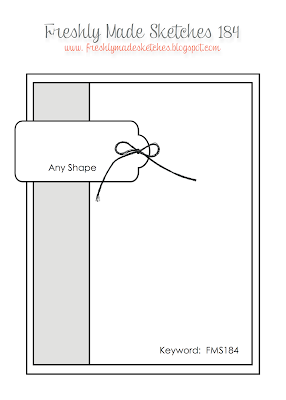 Today, Kim, who makes the most beautiful CAS cards, has a very fun and interesting sketch for us. 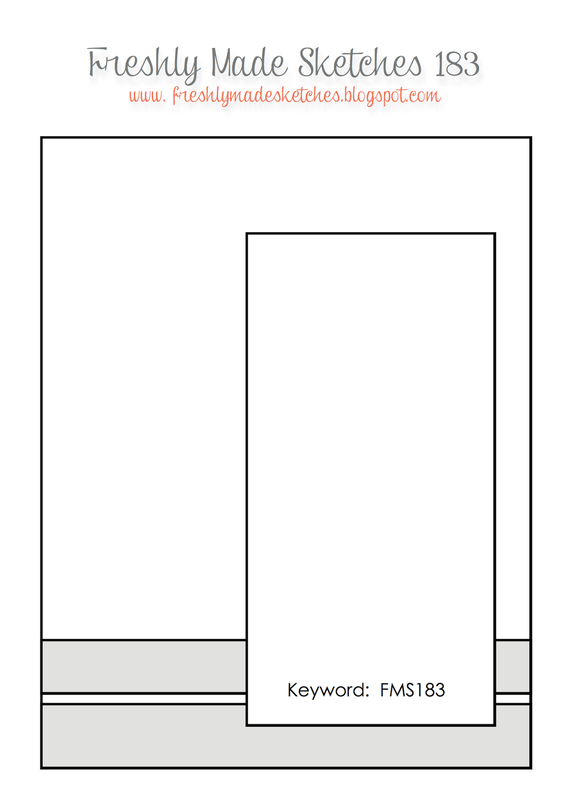 This sketch calls for an element to be off the edge of the card. How cool is that? 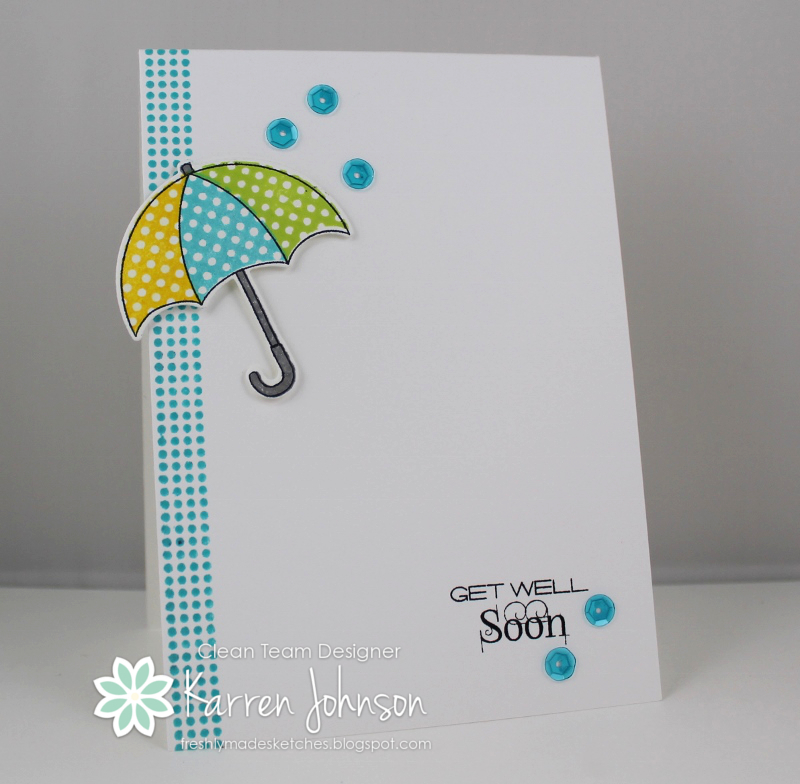 For my card, I decided to play along with the challenge at Friday Mashup, to use either umbrellas or polka dots. I went with both. 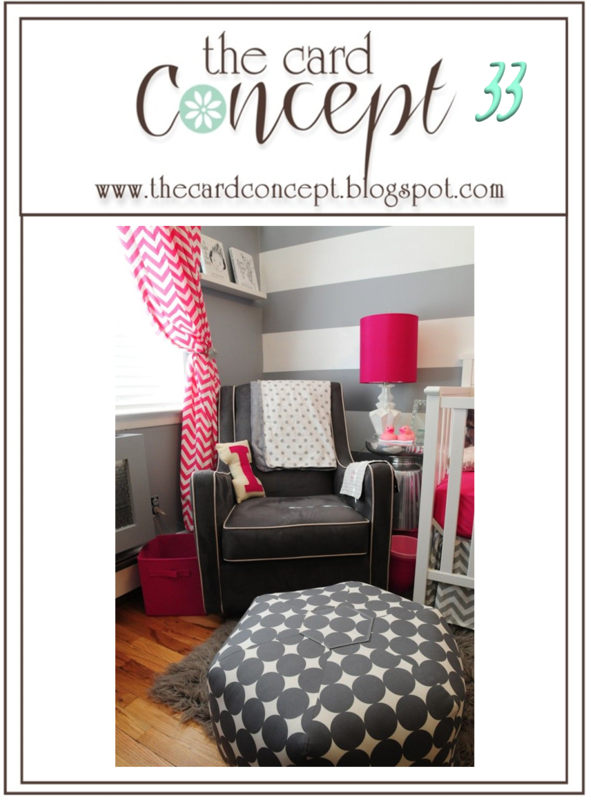 I'm also linking to The Challenge where polka dots are the theme. On my white cardbase, I stamped the polka dot strip in Audrey Blue down the left side of the card. I then stamped the sentiment in black. Then I used my Misti to stamp my umbrella and its components onto the die-cut before popping it up with foam tape on the card base. The umbrella was painted with clear Wink of Stella, which you can't see in the photo. Some blue sequins and I was all done. In hindsight, I possibly should have made the polka dot strip wider, but it's done and I ain't doing it again! Thanks for visiting. 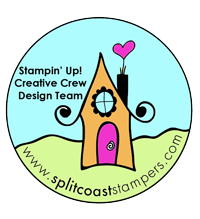 Be sure to check out the gorgeous creations from the rest of the amazing DT. And as a special treat, we have the genius who created Freshly Made Sketches as a guest. 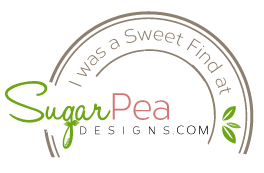 Be sure to check out Lesley's blog - she does amazing work! 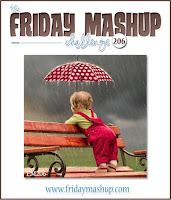 Edited to Add: This card got a shout out at Friday Mashup. 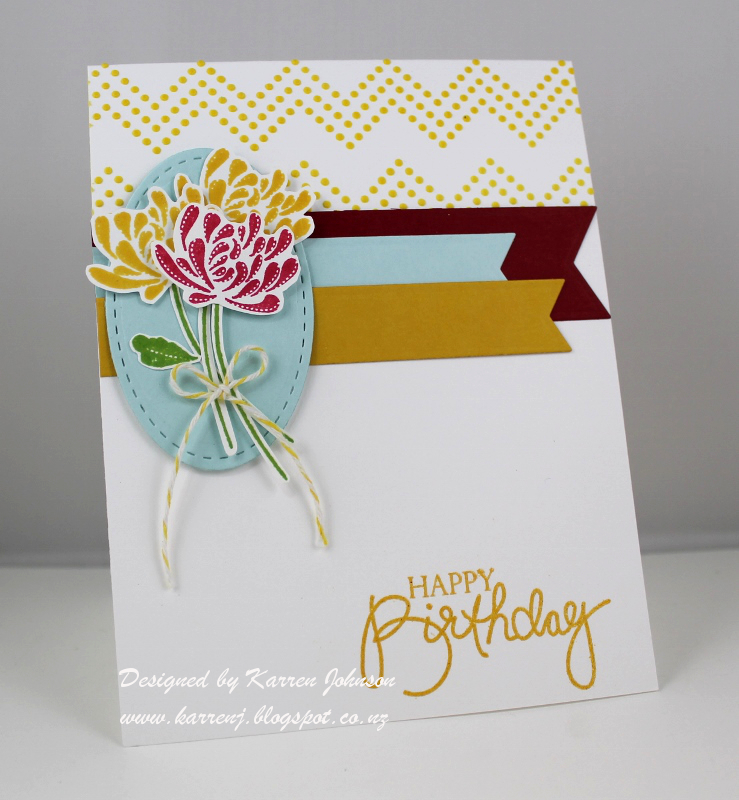 I made this card using the sketch at Just Add Ink, the inspiration pic at Just Us Girls and the Create your own Background theme at Seize the Birthday. I decided to use the purple tones with the touch of yellow and orange from the inspiration picture as a watercolored background. So I white embossed the geometric background stamp onto watercolor paper and then after liberally wetting the panel, I dropped on various distress inks. I concentrated on the purple tones with accents of yellow and orange, just like the photo, being careful not to overlap the colors too much. I cut the panel down and layered onto a black piece before adhering it to my Elegant Eggplant card base. The banners and circle were perfect for the sketch and I'd just received them as a freebie with my last order from My Favorite Things. I'm not too sure about the sentiment, but I had to look hard to find a big enough sentiment that still fit inside the circle. 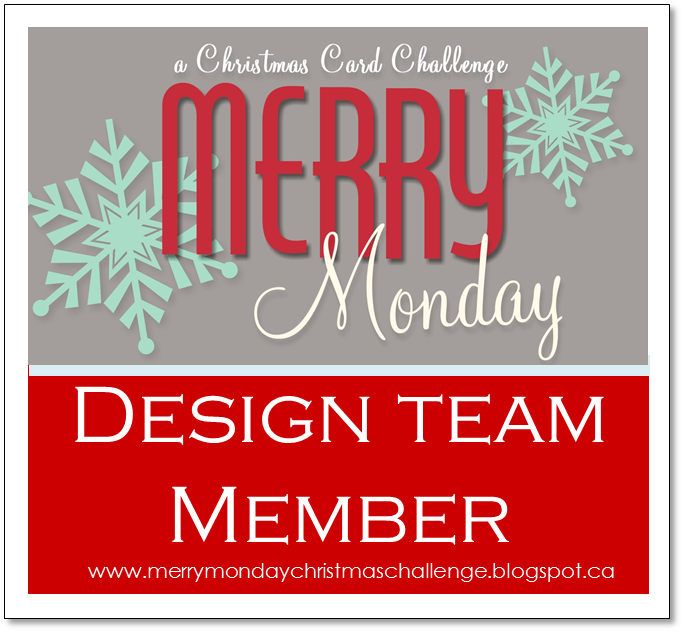 It's Merry Monday day and that means a new Christmas card challenge. 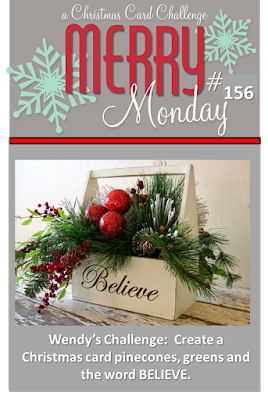 This week our hostess is Wendy and her challenge is to use greens, pinecones and the word "believe". 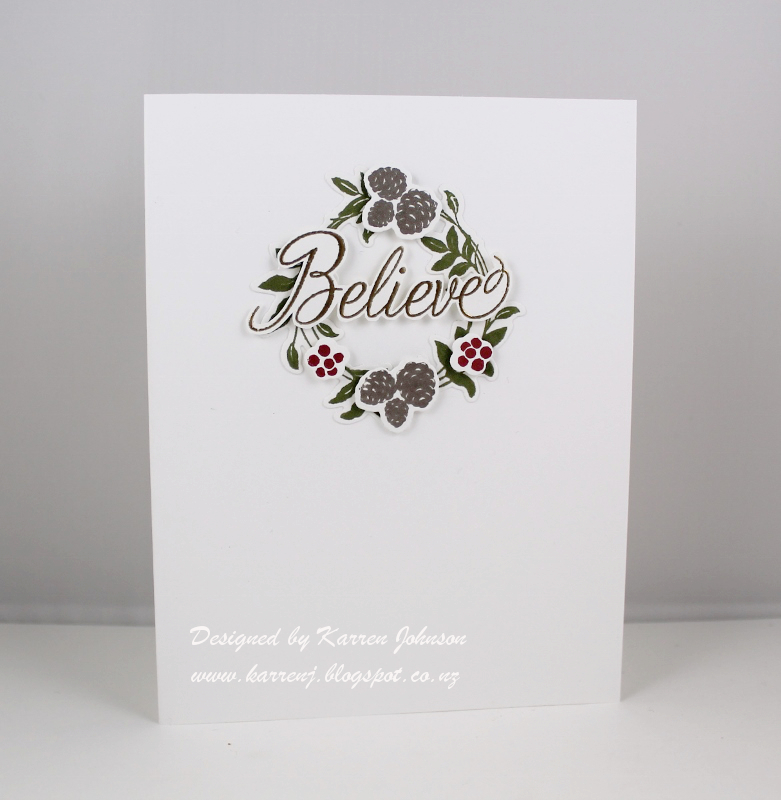 This was a real challenge for me as I don't tend to use the word "believe" in my stamping. So I hunted through my sizeable collection and found one stamp that said "believe" - never inked, of course! I turned it into this CAS card. 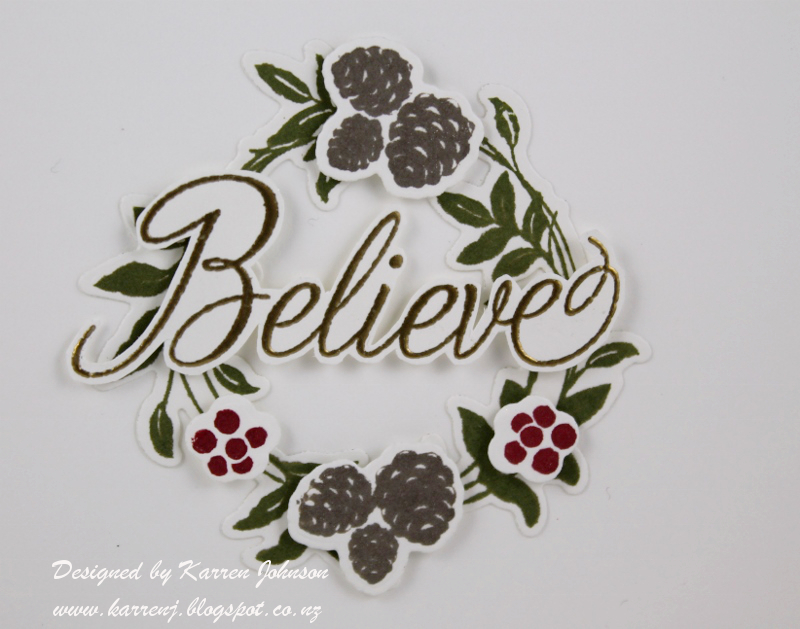 I stamped the wreath in Olive ink, then stamped and die-cut the pinecones in Sparrow and the berries in Schoolhouse Red, which were then popped up on the cardbase. I gold-embossed the word Believe and fussy-cut it before adhering to the cardbase using some foam tape. And that's it! Thanks for visiting. 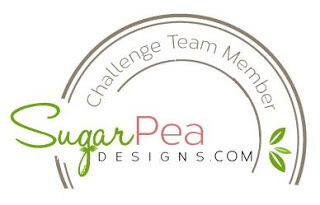 The design team have some wonderful samples to delight you so be sure to check them out. 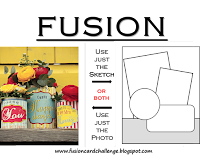 I made a card to cover several current challenges: Less Is More has a tag theme, AAA cards are looking for a hole in our card, the color challenge from ColourQ and the sketch from CAS(E) This Sketch. This card came together pretty quickly as I really wanted to try the ink smooshing technique. I love that technique! 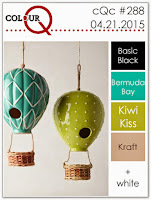 So quick and easy and I really love the little dots of color. 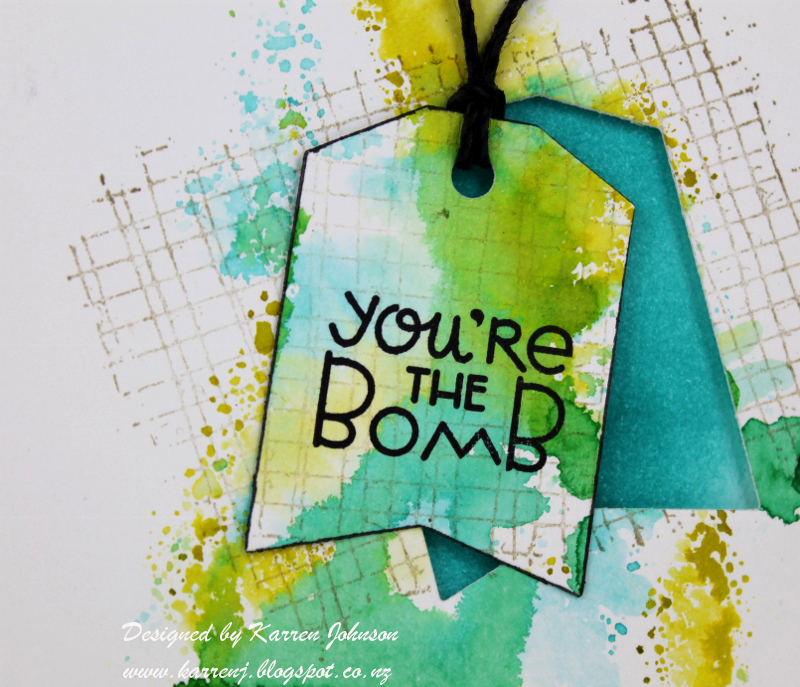 After I smooshed on the watercolor paper, I stamped a texture stamp with Crumb Cake ink then die-cut a tag. I went around the edge of the tag with a black marker to make it pop and stamped the sentiment from Slang Gang. On the card base, I sponged Peacock Feathers ink behind the negative die-cut. The watercolor sheet is popped up on foam tape onto the card base. 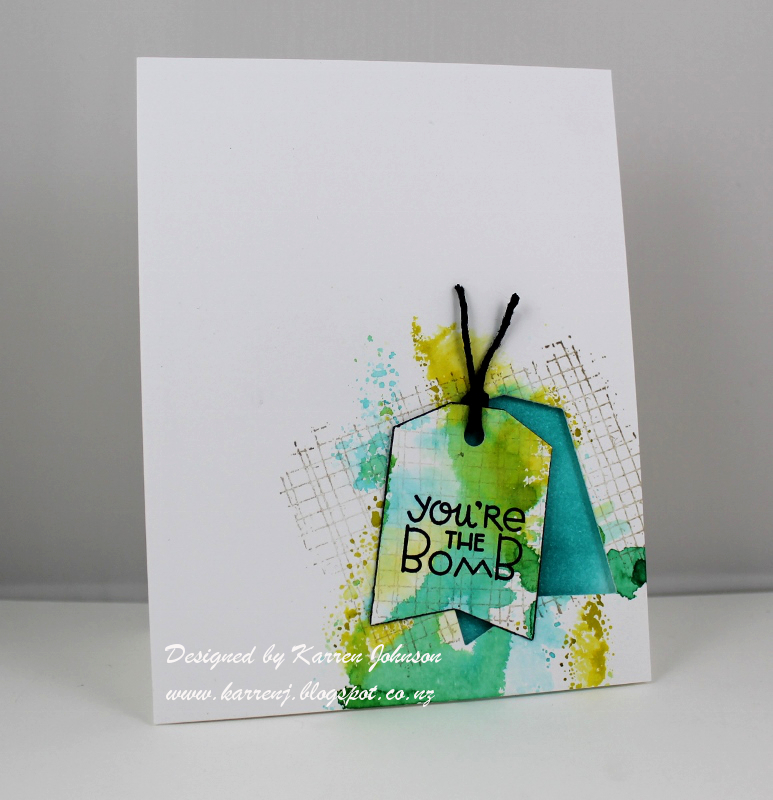 I tied some hemp twine onto the tag and adhered that to the card front and I was all done! Thanks for visiting. 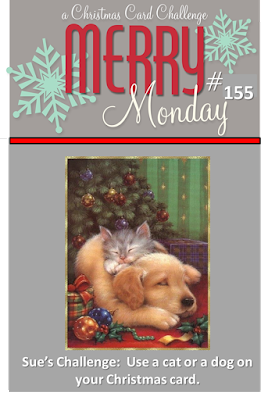 If I'm lucky I might have another challenge card to post today and then there's my Merry Monday post all scheduled for later on. 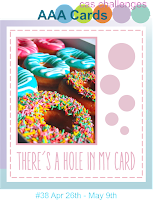 Edited to Add: This card got a shout out at Less is More and ColourQ. 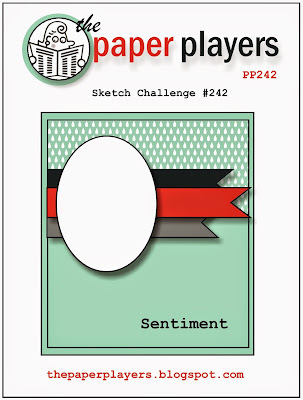 It's time for another challenge at The Paper Players and this week we have a a very cool sketch challenge from Ann. I knew I wanted some flowers in the oval panel that went over the edge, so I went looking for suitable flower stamps among my stash. 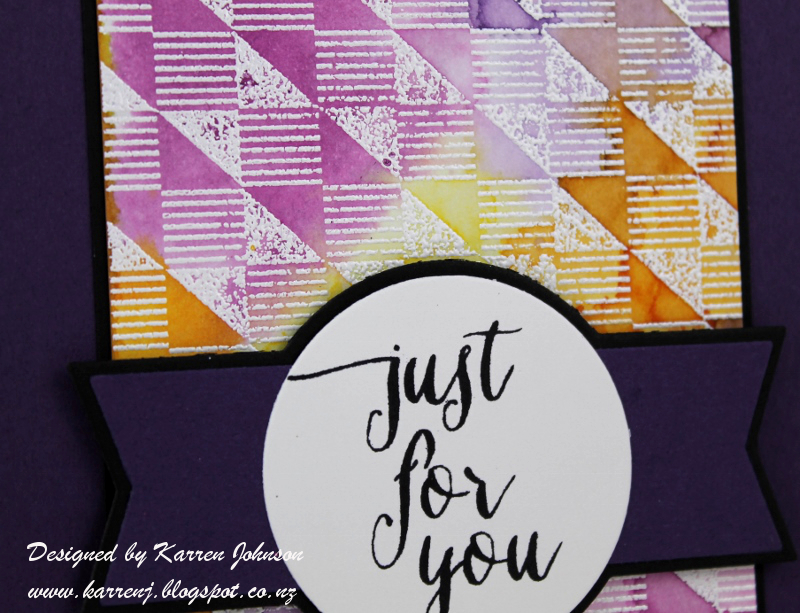 I decided on Mum's the Word and came up with this card, which also uses the colors and floral theme from the gorgeous inspiration pic at Fusion. 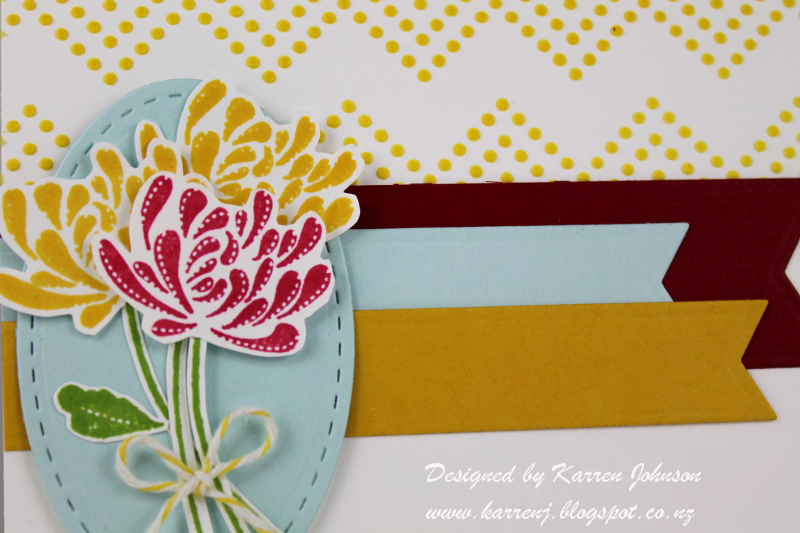 I stenciled on my card base using some white embossing paste I colored with Sunshine ink. 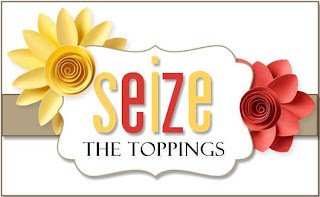 The banners were cut from Crushed Curry, Schoolhouse Red and Sea Glass cardstock. The sentiment is embossed with Crushed Curry EP. The flowers were stamped and fussy-cut before being adhered to the oval die-cut. To be honest, the red flower was already stamped and cut and I can't remember what color I stamped it in. I think it was Strawberry Slush but it doesn't match the Strawberry Slush cardstock very well, so I'm not sure. Thanks for visiting. The rest of the talented design team have some wonderful cards to inspire you, so be sure to check them out. Hi! It's the start of a three day weekend here as we're celebrating ANZAC Day today, where we commemorate those who were killed in war and honour returned servicemen and women. The day falls on the 25th of April, but in terms of public holidays it has been Mondayised and so this year we get Monday off work. I created an ombre panel by sponging with Lemon Chiffon, Goldenlocks and Sunshine inks, going from light to dark. 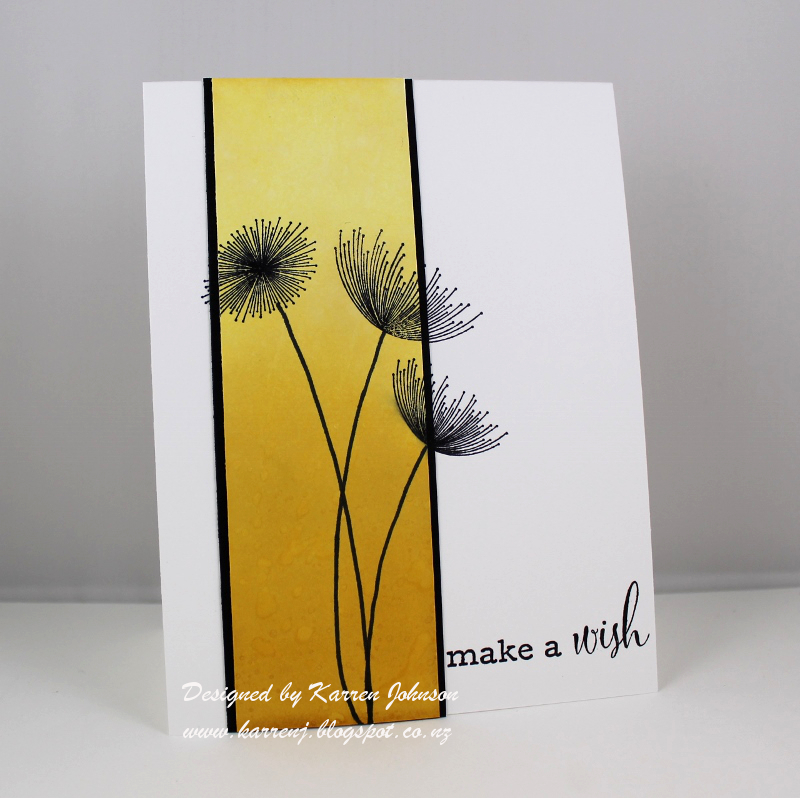 I then used my Misti to stamp the dandelion heads on both the ombre panel and the card base and getting them in exactly the right place! Gotta love the Misti! I used a Copic Multiliner to draw the stems as the ones that come with the set weren't long enough. I flicked some water onto the panel to give a bit of added interest as well. 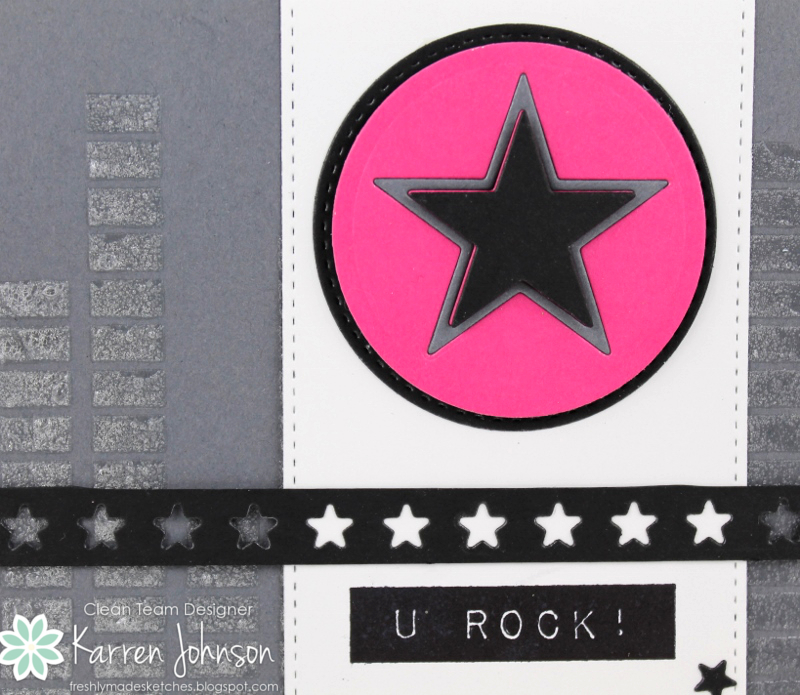 I layered the ombre panel onto some black card and then onto the card base. 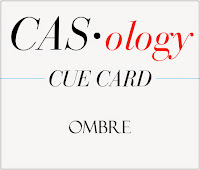 Edited to Add: This card got top honors at CASology and a shout-out at Color Throwdown. talented and funny Linda Callahan. Linda has come up with a very versatile sketch for us. For my card, I decided to use the inspiration pic at The Card Concept and produced what I guess would be a Clean and Layered card. And a bit of advice - heat-setting translucent embossing paste gives it a crackled look, so if you don't want that look, don't heat-set! I got a bit impatient for it to dry so gave it a blast. I quite liked the crackled effect so decided to use it. I again pulled out my new Blueprints dies for most of this card - love those things and have got a few more sets on the way! I inlaid the star and its frame then decided it didn't stand out enough so cut a black star and popped that up on foam tape. You can see a peek of pink star underneath, which is quite a cool look. 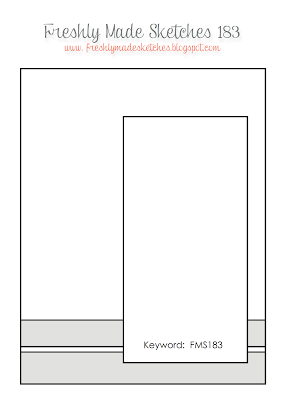 I hope you'll check out the rest of the design team's inspiration and have a go at this sketch yourself. 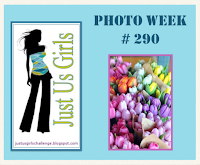 Welcome to Merry Monday Challenge Day. 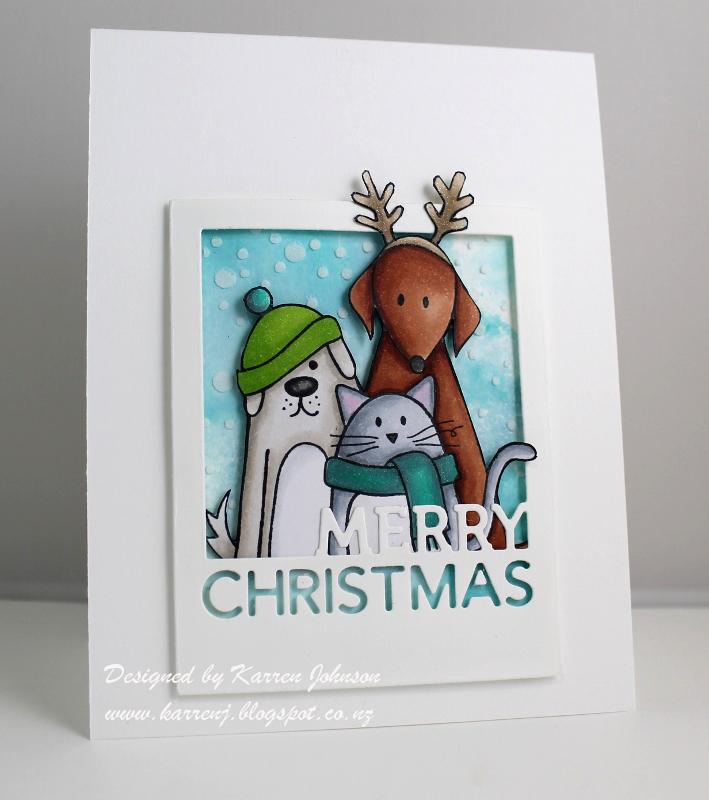 Today's challenge comes to us from Sue who has challenged us to use a cat or dog on our card. I covered all bases and used a cat and two dogs! 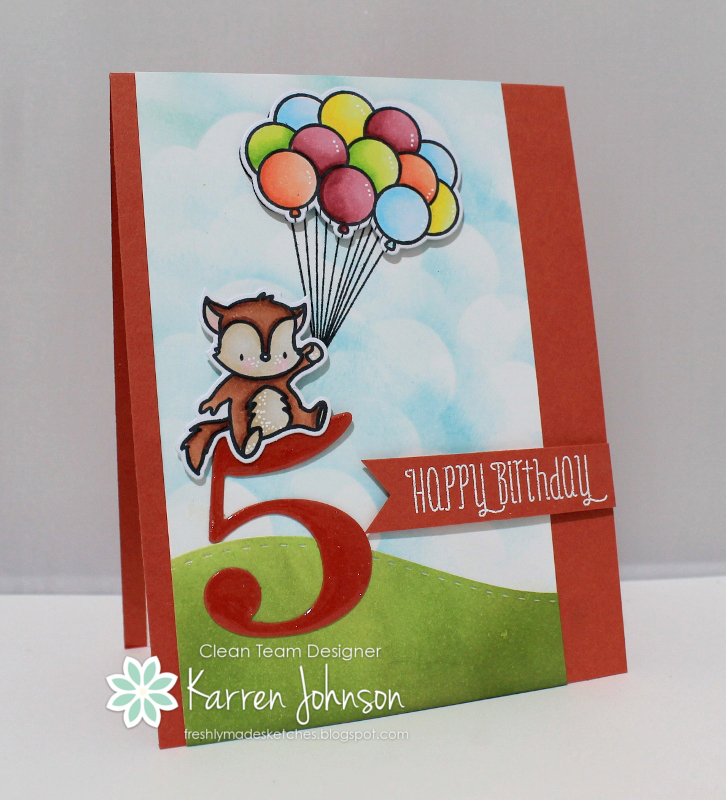 I just love this Simon Says Stamp image and decided to make a polaroid image. 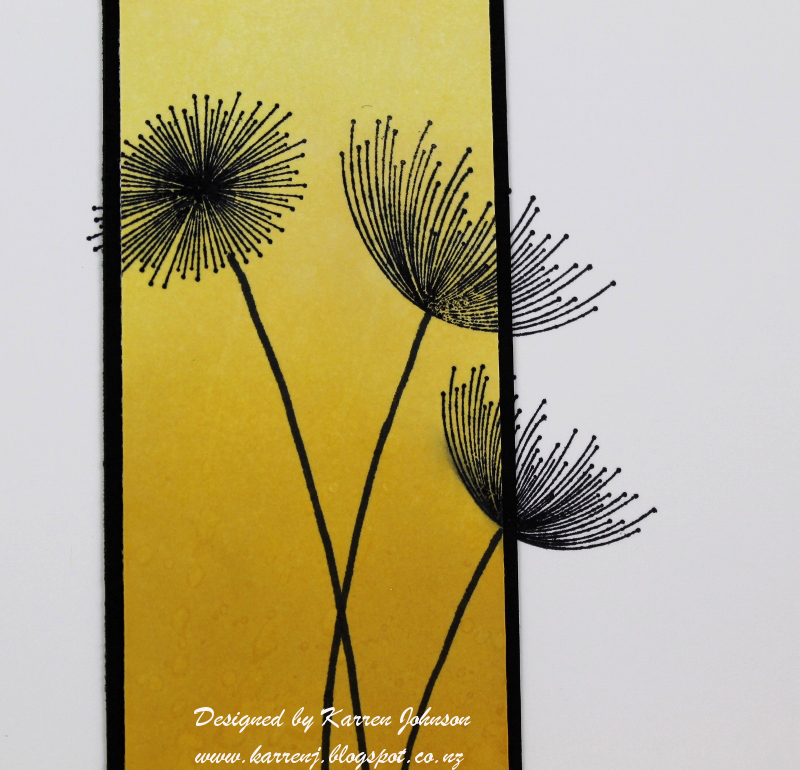 I sponged some Tumbled Glass ink onto some white card and then stenciled using the Falling Snow stencil. 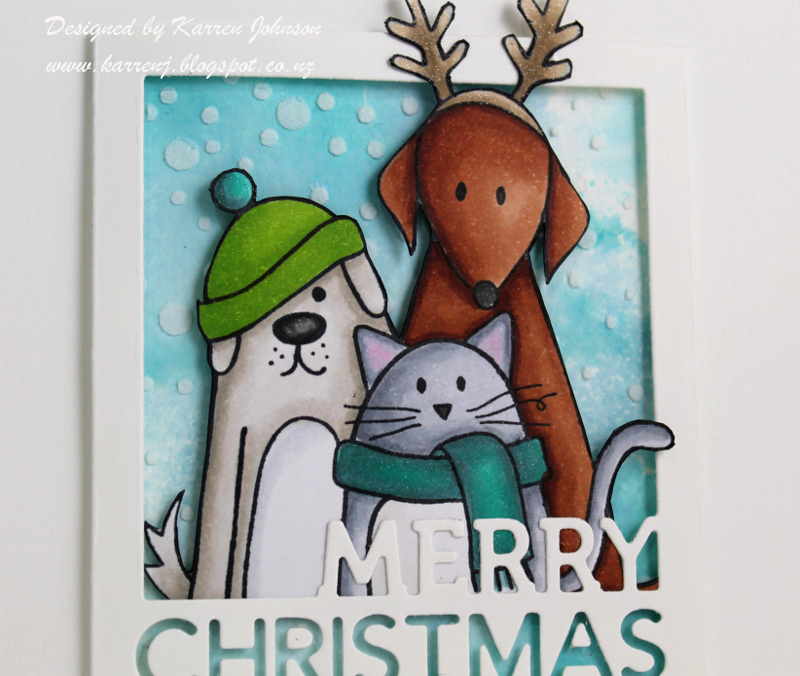 After I colored the image with Copics, I fussy cut it and popped it behind the Merry Christmas frame die-cut using foam tape. Thanks for visiting. 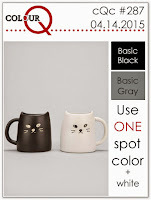 It's raining cats and dogs at the Merry Monday blog (groan! ), so be sure to head on over and check them out. 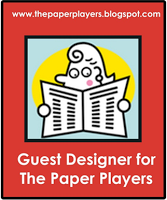 Hi and welcome to The Paper Players challenge! 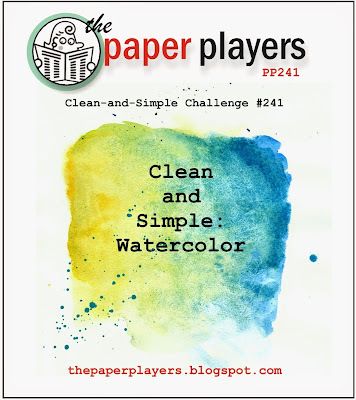 This week, Nance has challenged us to make a CAS card using watercolor. I went about as CAS as possible with my watercoloring - merely dropping some watercolor paints onto a white card base and letting them do their thing! I went with blue and aqua paints and concentrated on one spot on the card base. Once that dried, I adhered some vellum leaves, silver thread and a die-cut sentiment. 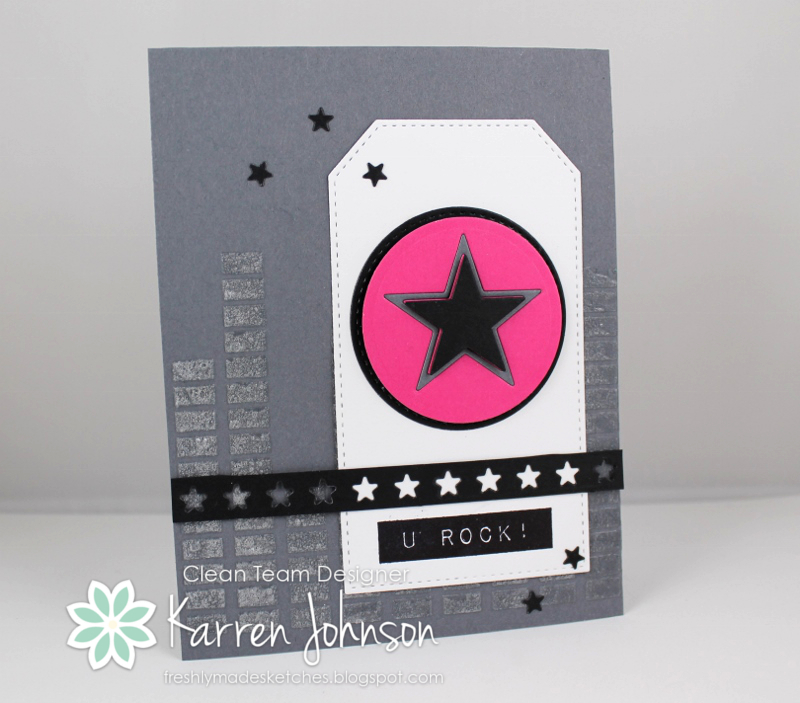 A few sequins and this CAS card was finished. Thanks for visiting. Be sure to check out the watercolored beauties created by the rest of the DT. Hi and welcome! This week I received an order of much-"needed" crafty supplies and included in the order was the super-cute Unforgettable set by WPlus9. 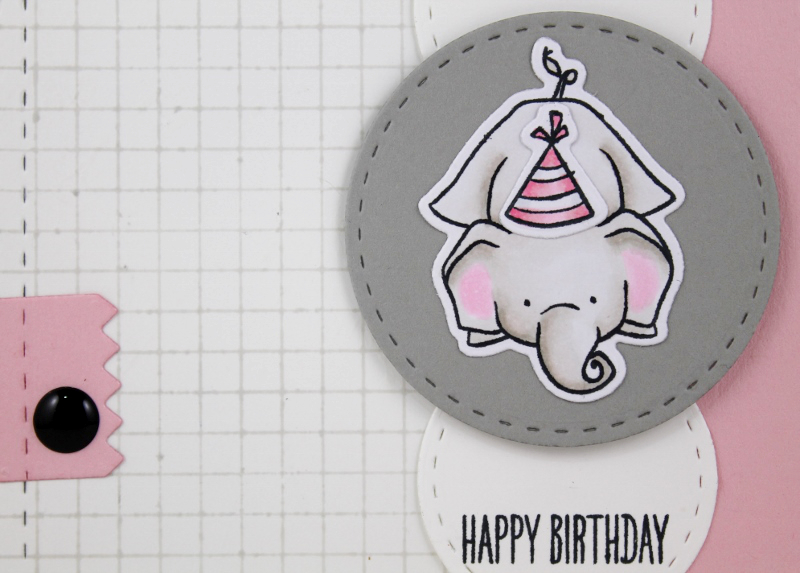 Who doesn't love those adorable wee elephants? So, of course, I had to ink them up and get out the Copics to make a card using them. I used the current sketch from Deconstructed Sketches, the colors from ColourQ and the inspiration pic from Card Concept (my card is Clean and Layered). 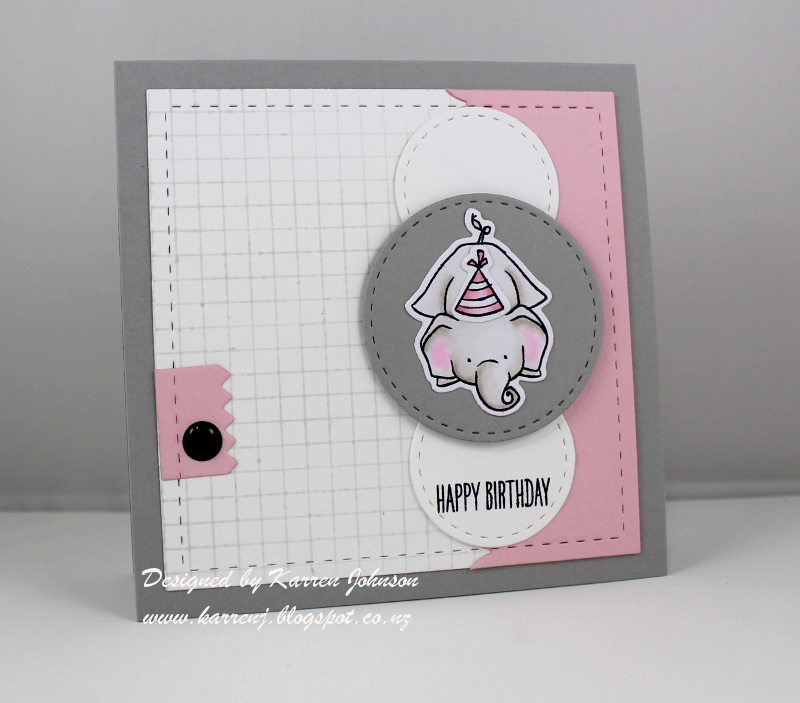 I stamped and colored this adorable little elephant and his party hat before cutting them with the matching dies. 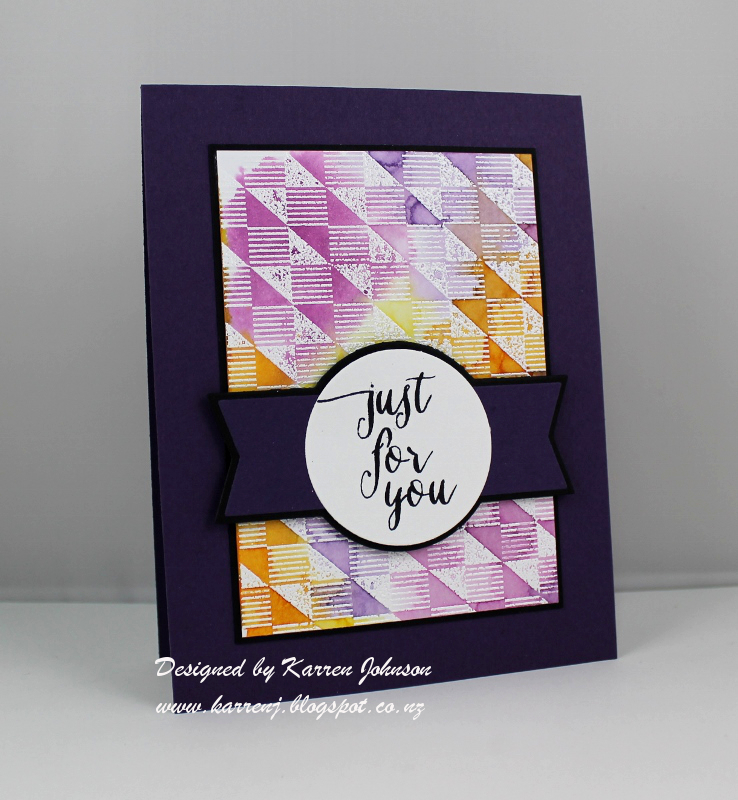 For the background, I stamped a Graph Background stamp onto white cardstock using Fog ink for a soft graphic background. Lots of stitched dies were also put to good use as well as some of the pieces from my new Blueprints die sets. 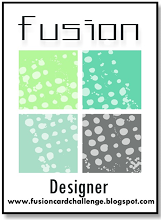 I hope it's okay with the ColourQ ladies, but I went with Smoke instead of Basic Gray to create a softer looking card. Edited to Add: This card got a shout-out at The Card Concept. Hi and welcome to Freshly Made Sketches! Today's challenges comes to us from Rita - who is fast becoming an expert at coloring with Copics! Here's her sketch for today. I needed a birthday card for my youngest niece, Roisin, who recently turned 5, so came up with this card. 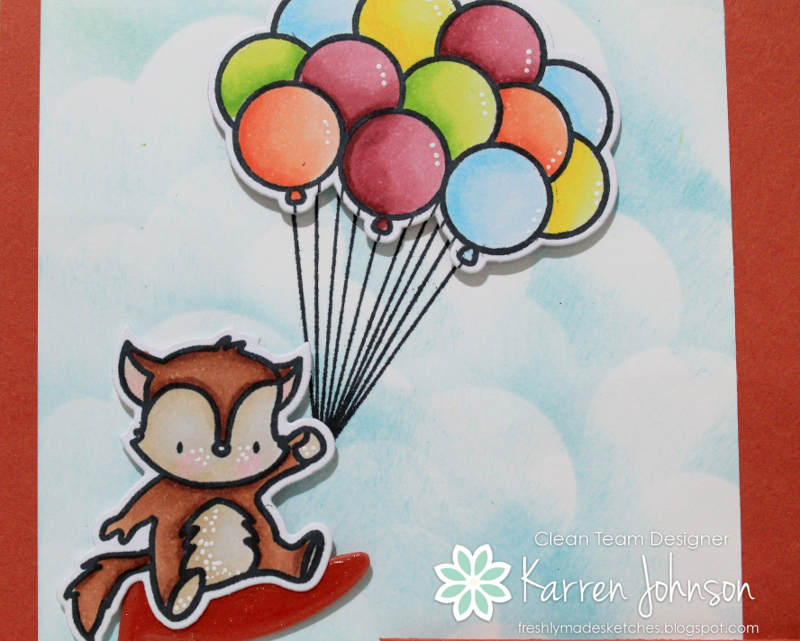 I Copic-colored the little fox and balloons before cutting them out with the matching dies. I then created a little background for him using a cloud die-cut as a stencil. The slope was sponged with Peeled Paint and Mowed Lawn inks. I die-cut a "5" and colored it with Wink of Stella before covering it with Glossy Accents. Once it was dry, I sat the fox on it and gave him the balloons to hold! A white-embossed sentiment and the card was finished. Thanks for visiting. As always, the rest of the design team have some wonderful cards for your viewing pleasure. Hi and welcome to Merry Monday! 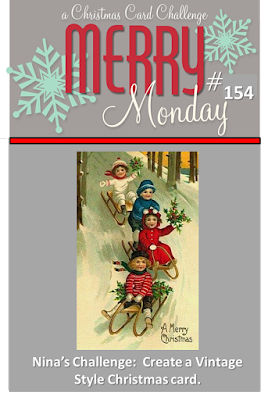 Today's challenge comes to us from Nina, who has challenged us to create a vintage-style Christmas card. I'm not 100% happy with my card - it's been a while since I made a vintage card and it took a long time to come up with something vintage-y. I decided to channel Nina, our challenge hostess, and use patterned paper for my card. All three panels on this card come from my Secret Santa gift from Sue, my fellow Merry Monday team member. Thanks, Sue! 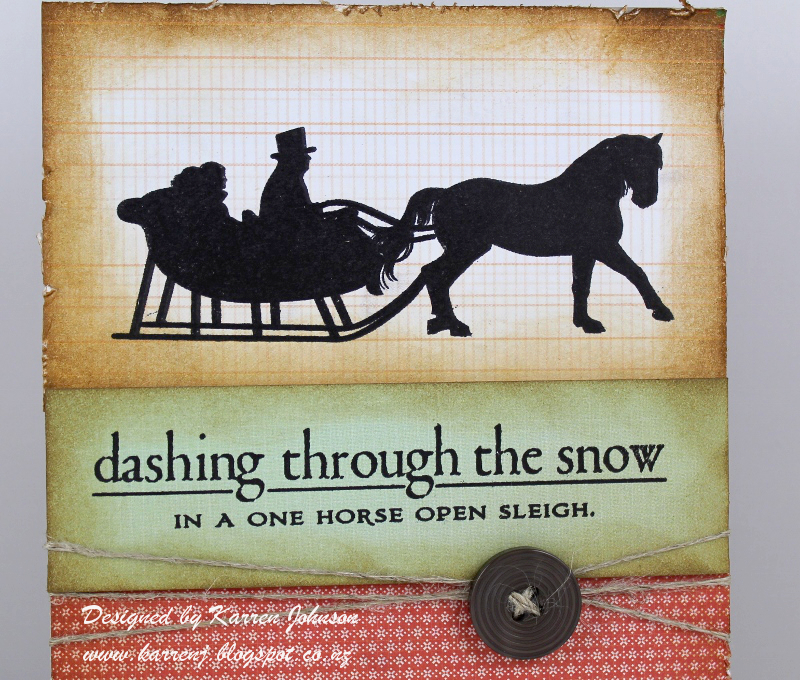 I stamped the sleigh using Archival Black ink and sponged and distressed the edges. 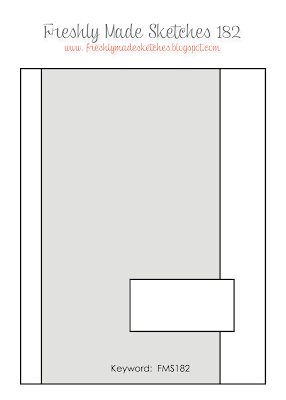 I did the same with the other two panels but didn't distress the sentiment panel. Instead I popped that up on dimensional tape. 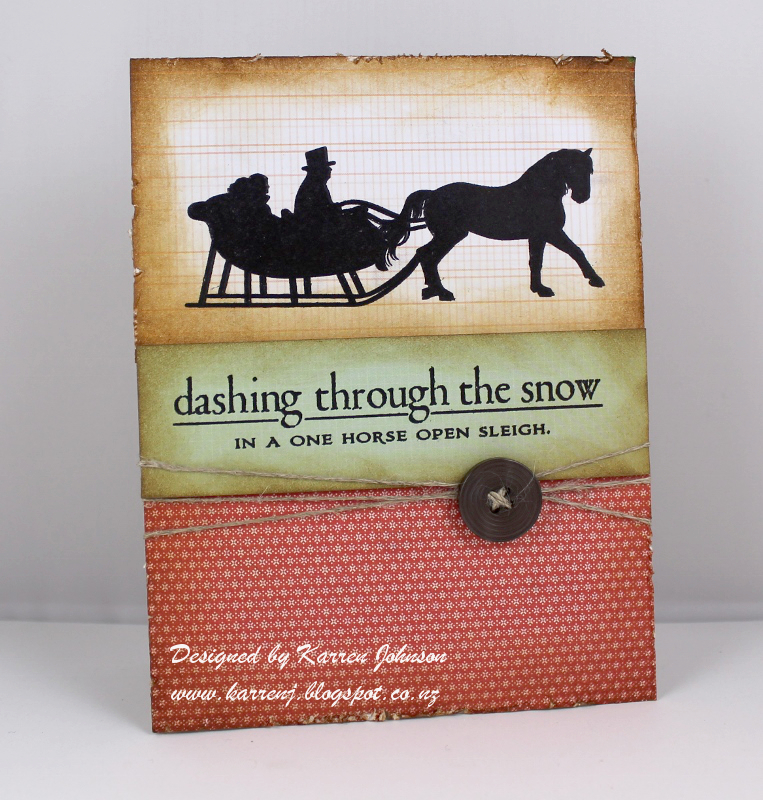 I finished off the card with a brown button and some twine. Thanks for visiting. The rest of the design team have some wonderful vintage creations to tempt you, so make sure you check them out. 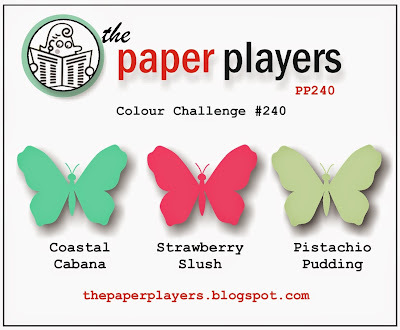 Welcome to The Paper Players challenge, where this week Joanne has a fun color combo for us to try. 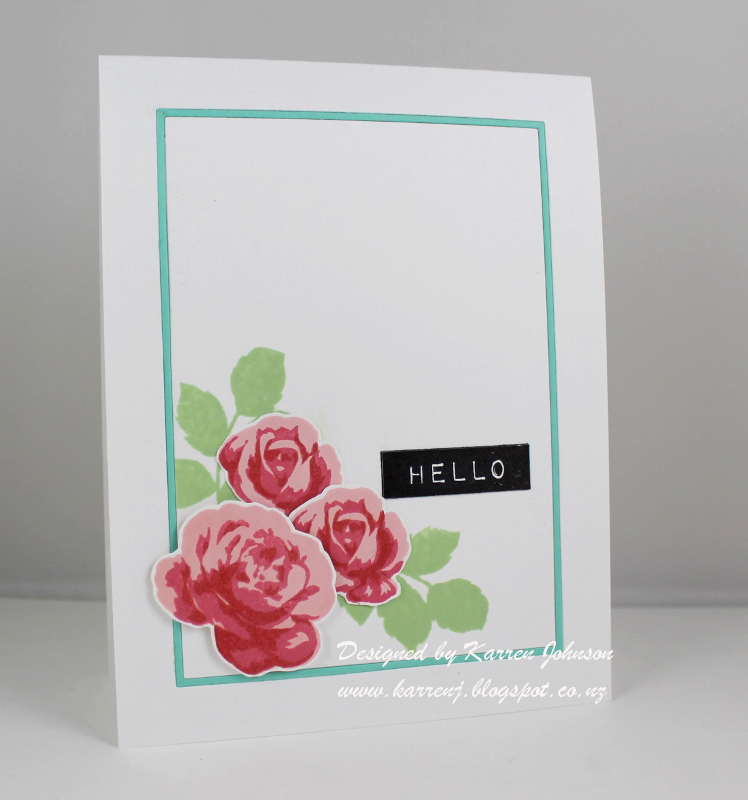 I wanted to try my new Misti with some multi-step stamping and chose to use my new Altenew Vintage Roses set. I had to stretch the challenge just a tad, because my foam Strawberry Slush pad does not play nicely when second- and third-generation stamping, leaving a splotchy mess, so I had to choose a lighter and darker ink that were in the same tone to work with Strawberry Slush. I hope this is okay with the rest of the team. 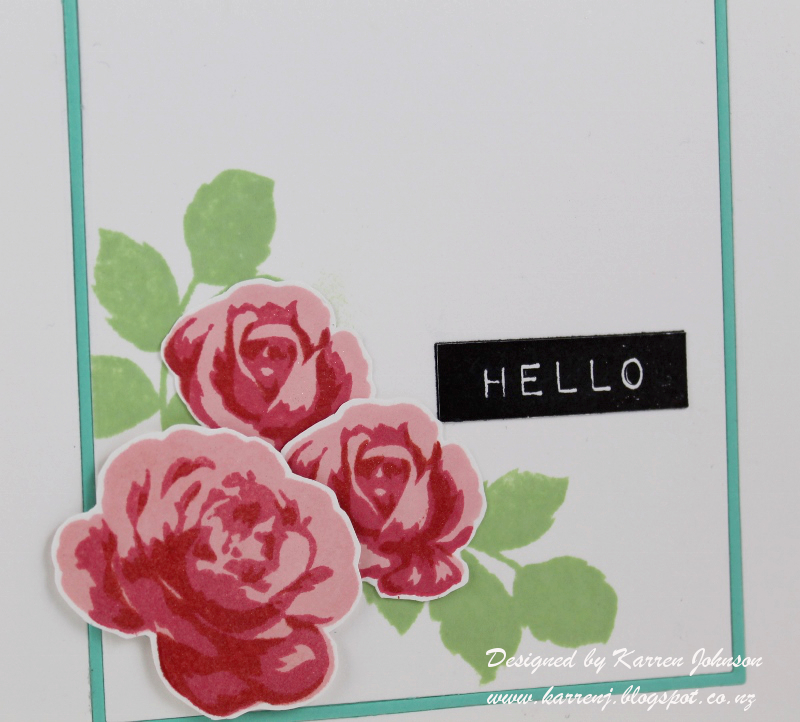 So, using my Misti, I stamped the roses in two different sizes using Cotton Candy, Strawberry Slush and Lipstick Red inks. I then fussy cut each of the roses. The leaves were stamped in Pistachio Pudding and the sentiment in Ranger Archival Black. I die cut a thin frame from Coastal Cabana cardstock and inlaid it into the card base. Thanks for visiting. The rest of the design team have done some amazing things with these colors so be sure to check them out.